I should, in all fairness to the band, point out that Mr. Sallo has gotten some of his facts wrong. Soldiers Field was chosen NOT because it was the site of the last Grateful Dead concert, but because Chicago was a central location easily accessible from all points. That has been the Grateful Dead members’ statement since the beginning. And yes, I have to admit that watching all of my friends get shut out of this event despite having mailed in their mail-orders on the first day, has been quite distressing. This includes my cousin Jerry who has seen several hundred Grateful Dead shows since his first in 1970! Jerry hopped on that bus long before I did and is still on it to this day. If any of my friends earned the right to receive tickets to these shows, he did. I myself didn’t even try. A Chicago stadium show was unappealing to me personally right from the get-go. Even if every ticket had been sold via mail-order. But I understand the disappointment. Dead-Heads pride themselves and the band on not being like every one else. There was always a sense of community, of being a part of something special, something ahead-of-its time and somewhat impervious to the perils of modern-day definitions of success and popularity. But truth be told, that started to change a bit in the last decade of the Grateful Dead’s touring history due to a hit-single that propelled their popularity into the mainstream, forever changing the dynamic between band and audience. Something I don’t believe anyone on either side saw coming or knew how to properly navigate. Do I think this whole event could have been handled better? I do. Do I believe it’s all about the greed of the band members? No. I think what has happened is more a reflection of the modern-day music scene than of the remaining Grateful Dead members’ attitude toward their fans and this intended celebration. It’s just unfortunate that it has gone down the way it has. There was never going to be a version of this story that didn’t disappoint some people. That was the catch-22 this band has always found itself in. I believe they’re doing the best they can under their current circumstances, which are unfortunate but unintended. It has been almost 20 years since legendary Grateful Dead lead guitarist Jerry Garcia transitioned to the big acid test in the sky. And since Jerry left us the debate has raged over whether the remaining members of the band — Bob Weir, Phil Lesh, Bill Kreutzmann and Mickey Hart — could call themselves the Grateful Dead. That question was answered definitively with a resounding “NO” this past weekend as some 500,000 fans logged on to the Ticketmaster website in an attempt to purchase tickets to the “Fare Thee Well” shows, scheduled for July 3-5 at Soldier Field in Chicago. You heard it here first: Even if these shows go down as the greatest in the history of rock and roll, this is not the Grateful Dead. Many of the 500,000 hopefuls had already engaged in the ultimately futile exercise of participating in the mail order presale, thinking they were participating in a revival of the beloved tradition that marked the band’s commitment to its fans by selling tickets directly, rather than through third-party agencies. Unbeknownst to the true Deadheads who put their hearts and souls into decorating their envelopes and sending off large sums of money on Jan. 20, back-room deals had already been made with big music industry players, such as Ticketmaster and a Philadelphia-based V.I.P. 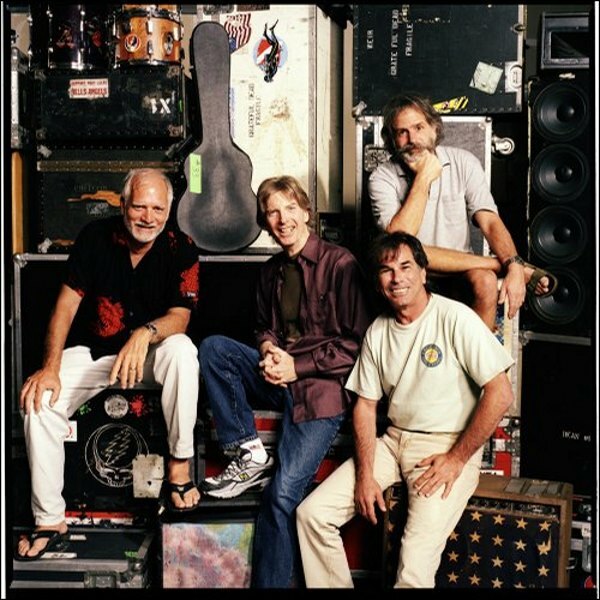 package provider called CID Entertainment (with options ranging from $519 to $2,198, plus “service fees”), to cash in on the genuine love and appreciation that is still alive and well among those who have never been able to replace the Grateful Dead as a source of joy and inspiration in their lives. Huh? You’ve received payment in the form of money orders from true, envelopedecorating, tradition-following fans for 300,000 tickets, have only 210,000 to sell, and you’re still going to be selling tickets online through Ticketmaster? In other words, you’re going to sell some of the tickets that have already been purchased by true Deadheads so that Ticketmaster can receive its cut. Nope, this is not the Grateful Dead. But it gets worse when you examine just how many tickets were held for Ticketmaster and other middleman partners to sell. It was announced through multiple sources last Wednesday, including the Chicago Tribune and Billboard Magazine, that only 10 percent of the mail orders are being filled out of deference to the need to save tickets for sale through Ticketmaster, et al. Let’s do the math: 300,000 tickets were purchased through the mail order, but they’re only going to sell 30,000 of those tickets so they can sell 180,000 tickets through other avenues that more generously line the pockets of big music industry players. Most suspicious of all is the way tickets mysteriously became available on eBay-owned StubHub immediately after the Ticketmaster sweepstakes ended. As of press time, literally thousands of tickets are available through StubHub in virtually every section of the venue for prices ranging from $600 (behind the stage with no view) to $3,500. Where did StubHub get all these tickets? They certainly didn’t get in line with 500,000 people to buy them from Ticketmaster! And if the inflated ticket prices on StubHub are unaffordable, you can purchase a parking pass for the modest price of $180 and enjoy the show from the parking lot at Soldier Field. Once again, where did StubHub get parking passes to sell? One answer may lie in the inexplicable choice of Chicago as the site of this quickly souring last stand. Despite having developed loyal followings across the country and even internationally, the Grateful Dead were first and foremost a West Coast band. The band members lived in the San Francisco Bay Area, as did the most longstanding fans of the band. Against that backdrop, why Chicago? That question becomes amplified when considering the fact that the Chicago Park District’s agreement with Chicago Bears season ticket holders entitles them to purchase their seats to all events that take place at Soldier Field. This may explain the sudden appearance of thousands of tickets on StubHub. The massive hype behind these shows had reached the radar screens of Bears fans, most of whom couldn’t care less about the Grateful Dead, but who saw an opportunity to make bank by turning a $199.50 purchase into a $3,500 trip to Puerto Vallarta. The party line that Soldier Field was chosen because it was the site of the last Grateful Dead concert on July 9, 1995 rings more hollow with every passing scalped ticket purchase. And then there is the perplexing choice of Phish lead guitarist Trey Anastasio to join the band. 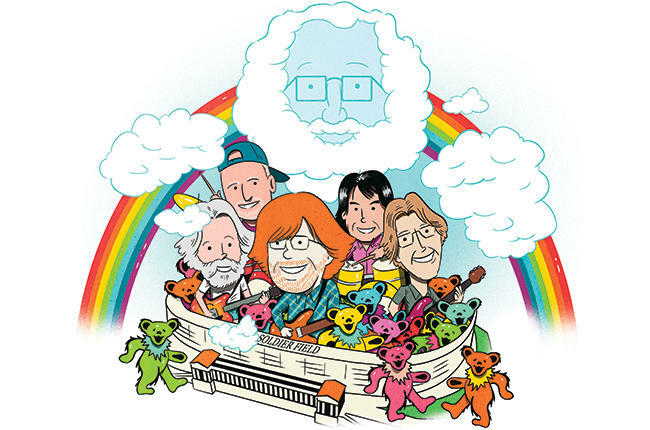 Since Jerry Garcia’s death, several notable guitarists have performed as a substitute for Garcia in various post-Grateful Dead bands, such as the Other Ones, The Dead, Dark Star Orchestra, Phil Lesh and Friends and, most recently, Furthur. These include Widespread Panic lead guitarist Jimmy Herring, who was a founding member of the group Jazz is Dead, and who played in The Dead and Phil Lesh and Friends; John Kadlecik, the founding lead guitarist of the Dark Star Orchestra who has been playing in the band Furthur; and Warren Haynes, who has played in the bands Gov’t Mule and the Allman Brothers Band, and who has been a part of The Dead and Phil Lesh and Friends. In many ways Haynes was the sentimental favorite, due to his creation of the Jerry Garcia Symphonic Celebration concerts, in which a large portion of Garcia’s musical compositions were committed to score and performed nationwide with a rock band, featuring Haynes on lead guitar, and backed by local symphony orchestras. All three of these fine musicians have studied Jerry Garcia’s music in a way that qualifies them to fill his enormous empty shoes. Not so with Anastasio, who has made appearances with Phil Lesh and Friends but was quoted last month in Rolling Stone as saying, “I never really sat and studied what Jerry actually played, until now.” It now appears that the choices of Chicago and of Anastasio were not made in the spirit of providing the truest Grateful Dead experience for the fans but, rather, to fulfill the highest possible financial gain for the promoter, Peter Shapiro in association with Madison House, and their corporate cronies. Centrally located, Chicago offers the best combination of logistical convenience and the big-city trappings that are needed to attract an audience who can afford “secondary market” ticket prices. And the addition of Anastasio piles on the interest of an auxiliary audience of “Phish-heads” to the mix, thereby increasing the available pool of wealthy spectacle-loving (as opposed to music- or Grateful Dead-loving) ticket buyers who can chunk down $600 to $3,500 for tickets that were originally priced from $59.50 to $199.50. All of this reveals a brilliant, even diabolical, marketing strategy. Choose a central location and a musical line-up that attracts the widest, wealthiest possible audience; create huge buzz through the Grateful Dead mail-order process to establish unfulfillable demand; and then let our friends at Ticketmaster, StubHub and other players in the “secondary market” (talk about euphemisms; we used to call it scalping) have at it. And here’s the kicker: Now Shapiro and Madison House are planning to create an entire industry around this weekend, including after-show concerts, audio and video recordings, and even a “pay per view” cable TV event. In short, get hundreds of thousands of people excited about an event they can’t get tickets for, sell their tickets to people who can pay aftermarket prices, and then charge the “losers” to watch it on TV. That was the Grateful Dead. And that’s the Grateful Dead I want to remember, not a cover band that happens to have some of the original members, and certainly not a musical spectacle that serves big-moneyed interests, such as Ticketmaster, StubHub, eBay, the City of Chicago and whatever other corporate entities are in on this colossal rip off. The Grateful Dead built their brand on their commitment to the quality of their music and to their fans. They became famous and enormously successful for innovations such as their focus on touring and live performances, rather than selling records; building their fan base by allowing fans to tape and freely share their performances; and by creating their own ticket agency, rather than allowing corporate middleman entities to control their scene, as has happened with these “Fare Thee Well” shows. With each passing day since these shows were announced, it has become clearer that the “Fare Thee Well” concept bears no resemblance to the Grateful Dead. There is nothing peaceful or forward-thinking about misleading people with hope in their hearts, and thousands of loyal fans have been hurt in the process. As difficult as it is to articulate the Grateful Dead philosophy, it’s not difficult for anyone who loved the band to come to the conclusion that this is not the Grateful Dead. Not much of it feels very good. Images of July look part corporate event (think Apple or other tech fan boys), part shopping mall, part big production concert and part sports event crowd control and then my only respite will be to keep my eyes closed or fully focused on Mickey and Kreutzman, Phil or Bob. It seems like a narrow hall to find semblance of what we cared for so much. I can’t disagree with you, Bruce. It’s the main reason I decided almost immediately that I wasn’t going to attend. It’s just not the parts of the scene I ever liked. I wish the whole event had been better thought out. Every interview I’ve seen and read and everyone I’ve spoken to with direct connections seem to say the same thing: that the boys were doing the best they could and didn’t anticipate this becoming what it has. I do hope the music’s good, at least. Not being a big Trey or Phish fan, he is not an allure for me, though I bet he sounds terrific with them. If I can stream it live in my home for a reasonable price, I probably will. Otherwise, I’ll wait for the music to show up online. Times have indeed changed. And the band –to some measure– along with it.